This story takes us on a search for the green sheep. We meet various sheep along the way, including blue sheep and red sheep; bath sheep and bed sheep. We meet sun sheep and rain sheep; car sheep and train sheep. But where on earth is the green sheep? Finally, at the very end of the book, we discover where the green sheep has been all along. 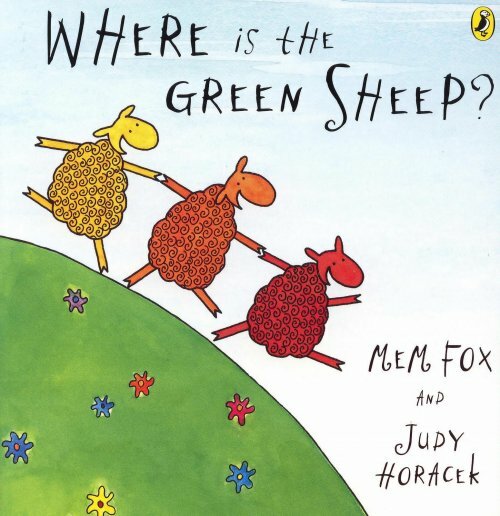 Where is the Green Sheep is a much-loved classic for speech pathologists and teachers due to it’s simple, repetitive rhyming text and the range of language targets it can be used for. It’s great for teaching a variety of concepts (see the list below) and introducing children to opposites (e.g. up/down, thin/wide, near/far). I like using this book in my narrative sessions to introduce young children to the word “where” and the concept of including settings in our stories. Kids love to talk about all the fun places they can find sheep in the book, including the circus and in space! The illustrations are simple, but very engaging and allow for lots of discussion beyond the story text. We enjoy talking about all the actions we can see the sheep doing, like flying, riding a bike, swimming and playing in the sandpit. For more speech and language targets in ‘Where is the Green Sheep?’, see the list below.